The XXII Olympic Winter Games from Sochi, Russia, kicks off on Thursday, and you’ll surely want to tune in for some of the action. Skeleton toboggans? Check. Jamaican bobsled team? Yeah mon. And did you see the Norwegian men’s curling team’s uniforms? I’m so there. Skeleton, the sport that asks you to dive head-first down a steep snow bank. There’s only so much you can follow through NBC’s recap footage they’ll show on TV, so if there’s a particular team or event you’re interested in, turn to streaming for more in-depth coverage. (And given the state of the hotel accommodations in Sochi, you’ll be more comfortable watching from home anyway.) Here’s the rundown of how you can stream the Olympics to your computer and mobile devices—all 15 sports, and all 98 events. NBC is the official U.S. broadcaster of the Olympics, and will be televising 539 hours of footage between its family of networks. This includes NBC, NBC Sports Network, CNBC, MSNBC, and USA Network. But the network will also stream every event live on NBCOlympics.com in real time as each competition happens. NBC anticipates its live streaming total to come out to more than 1000 hours of footage. This is awesome news for cable subscribers, but cord cutters are a bit out of luck. To get full access to NBC’s online streaming coverage, you’ll have to register and verify your cable or satellite subscription. If you’re cable-free, you’re limited to NBC’s highlight clips, full-event replays, and select live events—though NBC has yet to disclose which events the network will stream live to everyone. To binge-watch live Olympic footage day and night on NBC, you need a cable subscription. Not even Ryan Seacrest's tutorial can help you get around that. Additionally, you can get a daily temporary viewing pass for NBCOlympics.com. You can watch 30 minutes of live footage online for free the first time you visit, and 3 minutes of footage per day for each day after, until the Olympics are over. Sure, 3 minutes a day isn’t a lot, but if you time it right, you just might be able to catch your favorite athlete. 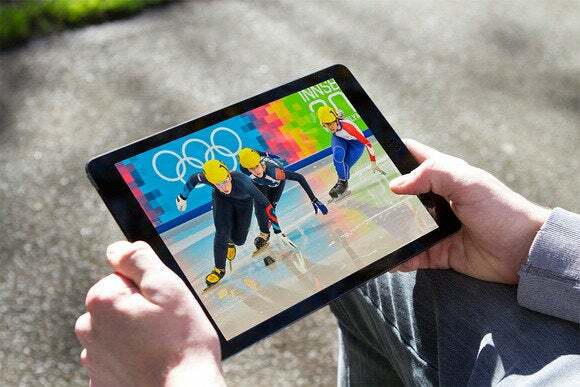 This isn’t the first year that NBC has offered live online streaming of the entire Olympic games: Its first attempt was in 2012 during the Olympic Summer Games in London. However, from what I’ve seen seen so far, this year’s offering doesn’t seem to have evolved much—which I find surprising, considering how popular cord cutting has become since 2012. If you’d like to watch live footage while on the go, your only app option is NBC Sports Live Extra, a free app for iOS and Android devices. Just like NBCOlympics.com, you can watch every event live straight through the app, and catch up on things you missed through highlights and event replays. (Because, let’s face it, even die-hard sports junkies will have a hard time keeping up with all 1000 hours of live footage, especially given the time difference between the U.S. and Sochi.) It even has a handy calendar of events, so you can create your own viewing schedule and set reminders. 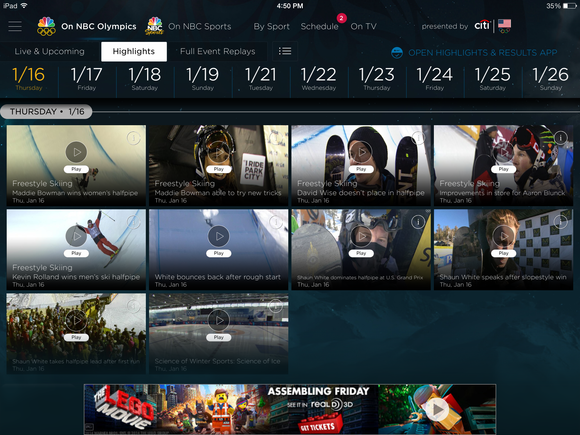 NBC Sports Live Extra has a full schedule of Olympic events, streams footage live from Sochi, and saves event recaps for you to watch later. Yet, again, to really take advantage of NBC Sports Live Extra, you need to verify that you have a cable or satellite TV subscription. Without one, you can still watch event replays, but you’ll be locked out of watching Shani Davis race for speed-skating gold in real time. Across the pond, the BBC will be streaming more than 650 hours of event coverage for free online and through the BBC Sport mobile app. Anyone in the UK can access this content, with or without a cable subscription, and the BBC’s offering keeps its live event streams, past event clips, Radio 5 live coverage, and other BBC Olympic content all in one place. It truly is a one-stop shop for everything Sochi. The big bummer for us, of course, is that this killer BBC content cannot be accessed outside of the UK—a practice known as geo-blocking. However, there is a workaround: You have to mask your IP address, the unique number that contains your actual geographical location when you’re online. Disclaimer: While masking your IP address to access international websites isn’t technically illegal, it is a bit of a gray area. So, I’ll just say this. One of the simplest ways you can do this is by logging in through a virtual private network. VPNs are closed networks that encrypt users’ connections, keeping you anonymous and showing the websites you visit the VPN’s information instead of your own. There are several VPN-for-hire services with small fees—about $5 to $8 a month—that you can choose from, both for Windows and Android users, and some geared towards members of the Apple ecosystem. Once your VPN is set up, just go directly to the BBC’s website and stream away. You could also check out Canada’s coverage through its network CBC, which will be serving up around-the-clock live content as well. If all you care about is who's winning medals (USA! USA! USA! ), skip the highlights and just ask Bing, or keep an eye on NBC's Olympics Highlights and Results app. Let the games begin!